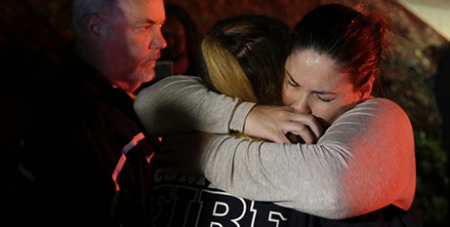 A Los Angeles bishop has asked people to “pray hard” for the victims of a shooting spree that saw a gunman kill 12 people at a Southern California country music bar. Source: CNS. “Like many of you, I woke this morning to news of the horrible violence last night at the Borderline Grill in Thousand Oaks,” Archbishop Jose Gomez said in a statement yesterday. Ventura County Sheriff Geoff Dean said yesterday that the suspected gunman, Ian David Long, had legally purchased the weapon used in the shooting. It came less than two weeks after a gunman murdered 11 worshippers in a Pittsburgh synagogue, which was the largest mass murder in the United States since 17 were killed at Marjory Stoneman Douglas High School in Parkland, Florida, on February 14. According to the Associated Press, after Sgt Helus was shot multiple times and dragged outside the bar by his partner – he died at a nearby hospital – scores of police assembled outside and burst in later to find Long and 11 others dead. Long had been wearing a black hood during the spree.